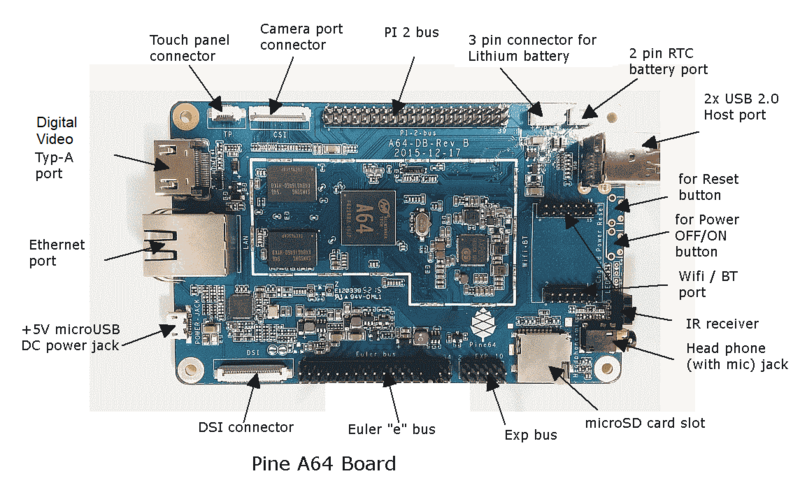 Tested on a Pine64+ 1GB running Debian 8 “jessie” (3.10.102-3) using the official WIFI 802.11BGN/BLUETOOTH 4.0 Module. Step 1: Make sure you have the bluetooth stack and utilities installed! If you want to all make sure you have all of the stuff this guide uses in one hit, you can add "rfkill git screen minicom" to the list of stuff to install. This repo contains the programs and firmware to operate the Bluetooth section of the RTL8723BS. This basically loads the firmware into the module, which makes it a bluetooth module! if you don't have git, install it by running "sudo apt-get install git". Step 3: Compile and load the firmware. Change into the newly cloned repo, and run "make", which will compile the main program needed, rtk_hciattach. Then run "sudo make install" to install the firmware. You’ll then want the following command to run at bootup, so perhaps put it in /etc/rc.local. For the moment though, you can run it as shown below. This is the command that does real magic… it configures the BT module and makes it available for use. and you should see something like this (if you don’t, something has gone horribly, horribly wrong already). If you get a message saying rfkill can’t be found, thats ok… just run "sudo apt-get install rfkill" to install it, and try again. and it will be unblocked. You sould then see if you run "sudo rfkill list" again that this is the case, and if you run hcitool dev, you should also have something like this as the ouput, listing the MAC address of the pine64’s BT adapter. You can then run bluetoothctl (as sudo) in order tha manage the bluetooth connection. Install via ‘sudo apt-get install bluez-utils’ if it is missing. You should get an immediate message about a new bluetooth controller… this is a good sign… everything is working so far if you get that message. If you get a message about no default controller, something is wrong. Assuming you don’t have any issues, run the following commands, which power on the BT module and sets it as the default BT agent. If all has gone well, you should be seeing something like this. You can then then enter "scan on" to start discovery of BT devices, and if you have any devices available for pairing, you should see messages about them appear (prefixed by [NEW]). If they’re not ready for pairing, this is the time to make them ready. Once your device appears, you can run "scan off" to make the system a bit more responsive again, as it seems pretty laggy at times whilst the scan process is running. To pair the device you’re trying to pair the pine64 with, enter the command "pair <your-bluetooth-deviceaddress>" . For example, my USB power meter with BT serial had an address of “00:BA:55:56:D8:7E”, so I entered “pair 00:BA:55:56:D8:7E” and entered the device pin when prompted. Once you see a message about the pair being successful (I had to do it a couple of times, it didn’t seem to take the first time) you can exit the bluetoothctl program with the quit command. This step is what makes the bluetooth device available for you to access. It’s really simple.. just run "sudo rfcomm bind hci0 <your-bluetooth-device-address>"
This binds hci0 (which you might remember from the rfkill list output from earlier) to the bluetooth device you specificied (usb power meter in my case). Step 7: Do something with it! And then try figuring out how to exit it – hint: it’s Ctrl+a, z, q, enter).I then get a line like this every 5 seconds (the update rate I have the meter set to) telling me the voltage and amperage being measured by the meter. Success! All it needs then is some simple decoding to change the interger values sent to their decimal equivalents (ie. the second line is 5.2496v and 0.5420A). Assuming you were working with a device that didn’t work one way (the meter only ouputs the data, it doesn’t have any configuration or anything over the BT link), you sould then have proper two-way communication via your device and the pine64 over bluetooth! http://forum.pine64.org/showthread.php?tid=1392 – posts by xalius and Faye on getting the BT firmware loaded and unblocked. "E: Package 'bluez-utils' has no installation candidate"
I can't find a solution to install this. 2. I can bind and I create /dev/rfcomm0. My apologies... I had updated the instructions in my own notes to omit bluez-utils as that was for an older version of debian, but hadn't updated that on the forum as my account was still in limbo. bluez-utils is no longer available, nor needed, as bluetoothctl is in the main bluez package. (09-30-2016, 09:07 AM)bj_jung Wrote: 2. I can bind and I create /dev/rfcomm0. So I take it you've run all the way through to the end, have paired and connected to your device, but screen won't connect to it? For starters, is the baud rate correct? What sort of device are you trying to connect to? My phone and pine64 paired, but not connected. I think I should confirm with bsp build option. Would you mind checking install process? I use "Debian Linux Jessie with Mate GUI Image  by lenny.raposo with Longsleep kernel" file. I don't know how to change bluetooth kernel option. Ok, so if you're trying to connect to your phone, you probaly need to see what bluetooth services it provides, and then work out how to access them. I'll try and look at that sometime tomorrow afternoon, but it's not an area I'm parciuarlly intereted in so don't know much about that. If you're running the debian MATE GUI image, is there any reason you're not using the GUI bluetooth tools? IIRC, that particular image is already setup for bluetooth access - I beleive you just need to run a command to enable it... there was a readme.txt on the desktop which detailed what was needed. I don't think you'll need to fiddle with kernel images and settings, the 3.10.103-longsleep kernel image appears to be correctly setup already for that. thanks for that ! ... very nice. As it appears that the OS isn't seeing Bluetooth, I assume as Peefrick said "something has gone horribly, horribly wrong already." Any suggestions for getting my Pine64 to see my BT module? hm... on the Debian Mate build, Lenny had already set up all the Bluetooth stuff out of the box... IIRC, there was just a single command you needed to run, and that was the last bit of info in the readme that was on the desktop. I'll see if I still have the image on a card, and see what the command was.